Share your favorite Comics and Cartoons from your childhood! What else did all of you watch or read when you were little/younger? Are they also things that exist(ed) for a long time already? I remember loving the Asterix comics (first came out in 1959) and different cartoons like Tom and Jerry (created 1940), Tweety Pie related things (don't you just love him and Sylvester? And of course Granny and Hector!) (the bird that became Tweety was created 1942, Tweety as we know him appeared first in 1947), and other Looney Tunes/Merrie Melodies (started 1930) like Bugs Bunny, Speedy Gonzales, or Road Runner. I also remember watching Disney cartoons like Chip and Dale (1989), and reading the comics about Huey, Dewey and Louie (1937/1938) with Donald and Scrooge McDuck. There's probably more, but those are the ones I can think of right now. Last edited by Evanna; 01-01-2018, 09:19 AM. i'm a Japanese, so i read a lot of Manga comics when i was a kid. i especially liked this one. Sasuke the ninja boy. Never heard of that one before, interesting! Thank you for sharing! The art style is cute, the cousins look adorable and the parents of them (?) very friendly. I can imagine that it was a fun thing to read! My favourite shows throughout my childhood besides the Smurfs were: Knight Rider, Dukes of Hazard, The Muppets, Fraggle Rock, A-Team, Looney Tunes, He-Man, She-Ra, Rainbow Bright, Scooby Doo, GI Joe, Transformers, Strawberry Shortcake, My Little Pony, Care Bears, DuckTales, Jem and the Holograms, Chip n Dale Rescue Rangers and Teenage Mutant Ninja Turtles. I didn’t get to watch a lot of tv as a kid (looking back this is a good thing, didn’t think so at the time lol) so I usually only watched at friends houses or when I would sneak up early on Saturday Mornings and watch before anyone was up haha! I wasn’t introduced to the world of comics when I was little, so I only read Archie’s Digests and DuckTales that were available at the grocery store and on the ferries. Oh, Duck Tales! I completely forgot about that! Watched that, too. And Darkwing Duck. Watched some of Scooby Doo as well. Care Bears! Ahaha, forgot about those, too. I watched that as well, yes. Another Chip n Dale fan, yay! Weren't they so cute? Haven't heard about a bunch of your list, though. May I ask: Do you remember some of your favourite Smurf episodes? (Or do you have some favourite episodes now?) I watched some yesterday, but am mostly unfamiliar with the series, so if someone wanted to recommend some episodes I wouldn't say no. Last edited by Morning Sky; 01-01-2018, 04:16 PM. i like Fix und Foxi too! unfortunately, i can't get their comics in my country and i could read only some of their episodes in the web. ( it seems their web page was closed ) the drawing arts by Fecchi were great. Had to look the last one up, never heard of that one before. 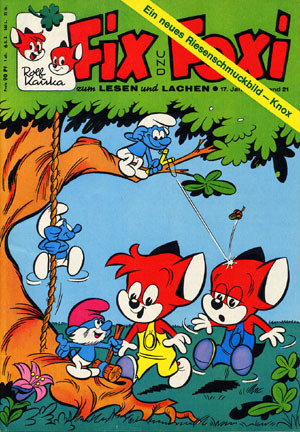 I think I read some Fix and Foxi too, but didn't own any comics. Maybe they were featured in a magazine I read? Mh... Didn't read much of them, but some. Last edited by ScottFioreD; 12-07-2018, 02:49 AM. Who remembers in the 80"s (showing my age) a kids programme called the little vampire. I managed to find the theme song years later. Apart from that I used to watch fragil rock (those little builder men), whacky races, what now, to name a few programmes. I also used to stay up on a friday night watching unsolved mysteries I was 10 at the time. My Favourite Comic is DC comics and My Favorite Cartoon is Ben 10. I loved the Smurfs, Asterisk, Donald Duck. We could collect smurf characters for a few months from a certain petrol station and I remember my sister and I begging my father to buy our petrol there. He was very good and did buy the petrol there despite a higher price . I remember sitting on the back seat in the car and hoping desperately that the little package he got when buying petrology would contain a smurf character that we didn't have. Unfortunately I no longer have any of these. They went in the bin a long time ago.